AiW Guest: Uche Peter Umez. 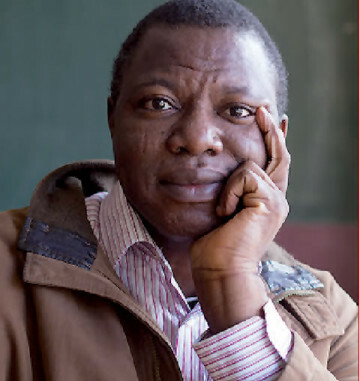 Interviewer’s Note: Remi Raji, Nigerian poet, scholar, literary organiser, and cultural activist, is the author of six poetry collections: A Harvest of Laughters (1997), Webs of Remembrance (2001, rpt. 2003), Shuttlesongs America: A Poetic Guided Tour (2003), Lovesong for my Wasteland (2005), Gather My Blood Rivers of Song (2009) and Sea of my mind (2013). He has performed his works in the US, Europe, South Africa, and Ethiopia. He is a lecturer at the University of Ibadan, where he is the Dean of the Faculty of Arts. A former General-Secretary of the Nigerian Centre of PEN International, he is the current National President of the Association of Nigerian Authors (ANA). His recently-published poetry collection Sea of my mind was longlisted for the 2013 Nigeria Prize for Literature. Uche Peter Umez: For some poets, the inspiration for a poem comes looking for them, for others they go searching for it. What’s your experience, given that you have published six poetry collections? And apart from your latest collection Sea of my mind, which of your poetry collection was the most difficult to write? Remi Raji: For me, inspiration arises from the awareness of the instinct to reflect and then write about an experience or idea. And the awareness I speak about comes from within primarily; a writer is either inspired or he is not; but a second kind of inspiration is that which becomes possible out of moments and years of training for that instinct, that fleeting delicate moment when the abstract imagination becomes flesh in the mind of the potential writer, the moment when the inner ear and eye can capture what has not been heard or seen by the other person. My practical experience has been both of primary inspiration and secondary inspiration. Which of my collection was the most difficult to write? The one collection I found difficult to decide upon was my first, A Harvest of Laughters (1997), not in the sense that I found it hard to write, but perhaps because it was my first published work, coming thirteen years after my graduation as a student of Creative Writing at the University of Ibadan. Umez: Although water imagery resonated in some of the poems in Sea of my mind, I was surprised to notice that there was more bird imagery than fish imagery in the collection. Could you talk about this? Raji: I will tell you clearly that all I set out to do was to capture all that was possible to be captured in the briefest space of poetry, using the “sea” as metaphor. But I am not sure if I actually intended to use bird imagery more than fish imagery, by which I think you mean water imagery. Also, I am not sure if I intended to draw on only just one cache of elemental imagery in the collection. Perhaps, it would just be better to say that I just wrote a decade of emotions into the work. Umez: There are slight echoes of J.P. Clark in some poems, of course you dedicated “Kiagbodo” to Clark, but a line in “Soft Bite” reminds me of a poem by Christopher Okigbo. Do you draw inspiration from these poets? What other poets would you be found reading these days? Raji: Of course, you know that a talent informs and is always informed by the tradition it serves and by the tradition it associates with. As some of my contemporaries who are aware of the discourse of Nigerian poetic tradition and the individual talent, I belong in the concentric circle of cultural influences and adaptations. There are indeed echoes of Clark, and Okigbo, and Soyinka, and Osundare in my poetry; true arrival is when those resonations become individualized and originality becomes a matter of difference. Part of “Kiagbodo” was composed in J. P. Clark’s riverine town of Kiagbodo, its parody in part of “streamside exchange” should be unmistakable to those who read Nigerian poetry closely. But I have a long line of poets who I draw inspiration from: Mazisi Kunene, Tchicaya U Tam’si, Kofi Awoonor, Kofi Anyidoho, Agostinho Neto, Oswald Mtshali, those early African poets who we were exposed to in formal schooling. Apart from these Africans, there is the heritage of African American and Caribbean poets from which I drew inspiration both as student and teacher: Paul Laurence Dunbar, Claude McKay, Langston Hughes, Margaret Walker, Robert Hayden, Edward Kamau Brathwaite, Derek Walcott, Imamu Amiri Baraka and Eugene Redmond. Three other influences from other literary traditions are Pablo Neruda of Chile, Czeslaw Milosz of Poland and Heinrich Heine of Germany. It seems, surprisingly so, that I have weaned myself of my first true influence, the huge English literary tradition of William Wordsworth, John Keats and T. S. Eliot! Surprisingly so because I realised that I overcame the classical influence even as I continued to teach the formalism of English poetic traditions as a standard example of engagement for the creative and critical faculties among my students. Umez: Seamus Heaney once wrote, “A poem floats adjacent to, parallel to, the historical moment. What happens to us as readers when we board the poem depends upon the kind of relation it displays towards our historical life.” So I was wondering if you wrote the poem, “At last poetry is on the streets” during the ominous periods of Occupy Nigeria: it reflected that particular historical moment for me. Raji: Interesting. Some poems arrive truly made for the moment. “At last poetry is on the streets” is one of such poems. Given our historical antecedents, the poem is not likely to suffer the pang of a topical text because it continuously means more than what I had imagined when it was written. Its creative process was that of Occupy Nigeria, but you will not find the particularity of that historical moment in the lines. Personally, I always want to defy topicalities in my poetry, yet there are poems that won’t give. Raji: Again, the poem may not be about me, but it is essentially the imagination of what must have occurred or what should have been. I hope you are aware that the poetic persona is not necessarily the poet in person, so this is not about me. Yes, you are right: “Untold”, as I imagined it in composition, is about the dilemma of prevarication and indecision. Umez: One recurring feature of your poetry is that a good number of your poems are written precisely for the ear rather for the page. Do you agree? Do you think you are writing for “performance”? And do you have in mind that you might have to perform the poems at one time? Raji: I have had occasion to reflect on the dialectic of poetry and performance poetry, theoretically speaking. In practice, I try to collapse the difference and work between the rigour of the imagery for the eye/brain, and the energy of the voice in flight. I believe that good and enduring poetry must be for the page only because it has to be written, but the good poem must and should be readable, friendly to the spoken word without being pedantic and pedestrian. For me, poetry is all about the feelings of knowing by all the senses possible – seeing and hearing, and perhaps touching as well. Umez: In all your poetry collections, there has been this abiding theme of political consciousness, an undying love for the land, even when it makes “serial casualties” of us, even when it “spins on the pin of our pains”. Why do you think poetry matters? Is it potent enough to incite political action in a country infested with crass materialism? Raji: As a student of literature and political history, I know that poetry, where it matters, does matter. I know that fiery but persuasive words have moved mountains off the road of oppression. Perhaps not yet in my country. Yet I believe that poetry does matter. I am both inveterate optimist and incorrigible radical nationalist. I believe that when words are carefully used over time, they will not only incite, they will exert the force of action necessary for change. Umez: How much of your background as an academic informs your vision of poetry? How do you balance teaching, literary criticism, poetry writing and social activism? Do you feel limited in any way? Raji: Rather than being limited, I believe I am very privileged as a student and teacher of literature, a literary scholar writing poetry and involved in social activism. It is about an engine running full steam, and I am afraid sometimes that I am too dedicated to the vocation. My background as an academic deeply informs my idea of poetry, and you should be surprised if it doesn’t. Also, I bring to the formal training what I call the native intelligence of the heritage of Yoruba poetry recitation. Umez: Your earliest collections, A Harvest of Laughters and Webs of Remembrance, were shaped by robust lyricism, whereas your latest collection, Sea of my mind, is much more tempered in its lyricism. What could account for this? How much does your lyricism draw from oral tradition? Raji: As I noted earlier, the ready-formed poem must be both written and readable, oral and aural to a very large extent. I have always depended on the intelligence of orality. It is of course natural to grow into it and be influenced further as you develop towards certain originality. I do not believe in simple transliterations of the heritage of oral poetry which forms the base of the typical written African poetry. Lyricism is therefore a constant, like the breath, with its unique heave and pace at different moments. Umez: Could you talk a bit about “Our fragments?” In this poem, the words were running into each other, why did you choose to structure the poem that way? What shapes a poem for you? Is it mainly visual or aural? Raji: I will simply say that “Our fragments” is a doubly ironic poem. I still await more criticisms of the poem. 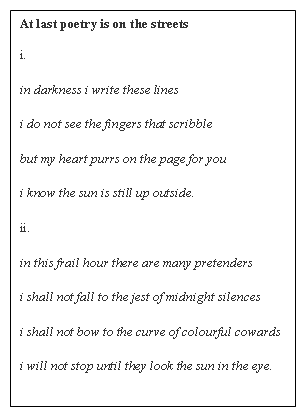 I will only add that the poem speaks for itself, graphologically. It has become a sort of test and game for the first comer to that collection. Poetry is all about structure, and the structure includes visualization, aurality, and the tangibility of the text. Umez: And finally, as a literary critic, how would you define this current generation of poets, particularly the emerging voices in Nigerian poetry? Generally, what do you think of the present situation of poetry? Raji: There are many young Nigerian writers who are doing good poetry now. I will not assay to call them a generation per se, but a few serious and engaging works are emerging. Perhaps because of more critical interest in prose fiction, some of these writers have not had adequate attention. This is not strange. It is only those who are consistent in their art, those who do not go after the hype and glamour of being called poets, who will survive. However, the present situation of poetry, at least the parts I have seen and heard, does not portend well for the good health of a really emergent generation. As I said, there are some who are really talented and engaging; but there are also many who think of poetry as prattle or words foaming by the sides of the mouth, what they call “spoken word”. In real cosmopolitan traditions where the “spoken word” comes alive, as opposed to the conventional practice of screamers and word-munchers, there is real poetic energy, there is measured fire, rhythm and the lyricism which differentiates enduring poetry from plain doggerel. Being in the digital age has helped some, but it has also foisted a rash of poetasters on the land. The positive force of social media is yet to be harnessed in this part. I believe it will be soon, some of those serious, engaging and engaged young poets will break forth. Uche Peter Umez is a poet and short fiction writer. An Alumnus of the International Writing Program (USA), Uche has participated in residencies in Ghana, India, Switzerland and Italy. He was one of the winners in the Commonwealth Short Story Competition in 2006 and 2008 respectively, and has twice been shortlisted for the Nigeria Prize for Literature in 2007 and 2011. His latest children’s book Tim the Monkey and Other Stories has just been published by Africana First Publishers, Nigeria. A very interesting interview. Remi Raji is a fascinating poet with very sharp sensibilities. It’s amazing to find here that he is also inspired by the works of other African and non-African poets drawn from a rich tradition that I’m also a fan to as a poet myself. Thanks, Umez, for this! Quite engaging an interview…Prof. Raji is just right!